A New Pizza Recipe That's Kid and Tailgate-Friendly! We’re in the thick of fall — my favorite season — and with it brings football, tailgating and the foods that go along with those activities! But those foods don’t have to mean wings and delivered pizzas. 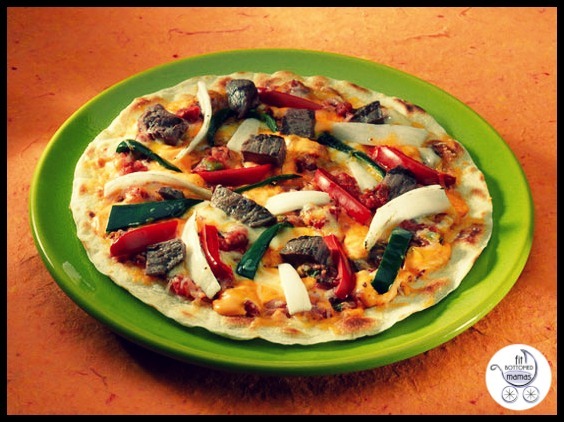 We love this quick, easy take on pizza from Cibo Verde that can be made gluten-free by using a g-free tortilla. 1. Place the tortilla on a baking sheet and add pizza sauce making sure to spread evenly on crust. Follow with cheese, onions, peppers and steak. Place in 350-degree oven for five minutes or until cheese has melted.